Thousands gathered in the Russian cities of Novocherkassk, Bryansk, and Belgorod to support the Russian-speaking population in Ukraine. 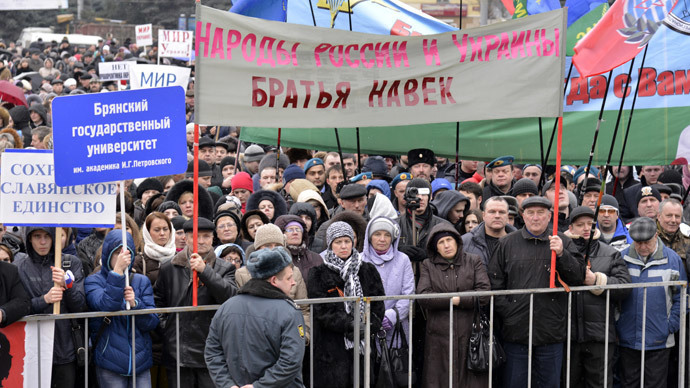 “We don’t abandon our people,” said banners held by those who sympathized with residents of the crisis-torn country. Nearly 7,500 people took part in a demonstration in the southern city of Novocherkassk, one of the biggest industrial centers of Rostov region and capital of the Cossacks. What is currently happening in Ukraine can hardly be called “democratic reorganizations,” said Anatoly Nosyrev, world champion in kickboxing and Novocherkassk resident. Rallies in the southern city of Bryansk, a center of steel and manufacturing, attracted over 5,000 people, local police told ITAR-TASS. Among those present to support Ukraine were World War II veterans, activists of public organizations, students, and teachers. “I sympathize with Ukrainian people, especially with the citizens of Crimea and Sevastopol,” said Vitaly Volvich, a citizen of Bryansk. The rally, held under the slogan, 'We don’t abandon our people,' started in the city’s center square. 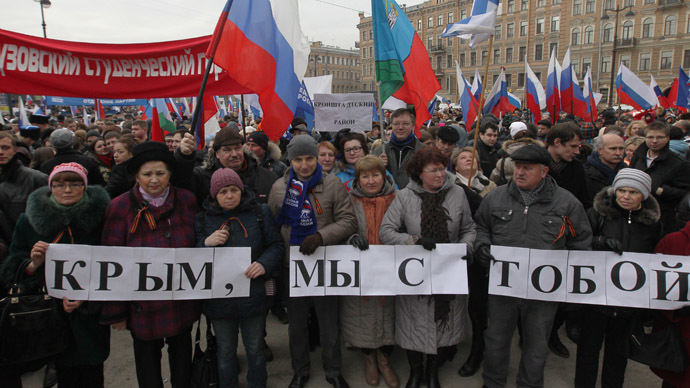 “By this demonstration, we give hope to all the citizens of Crimea that Russia doesn’t abandon them. 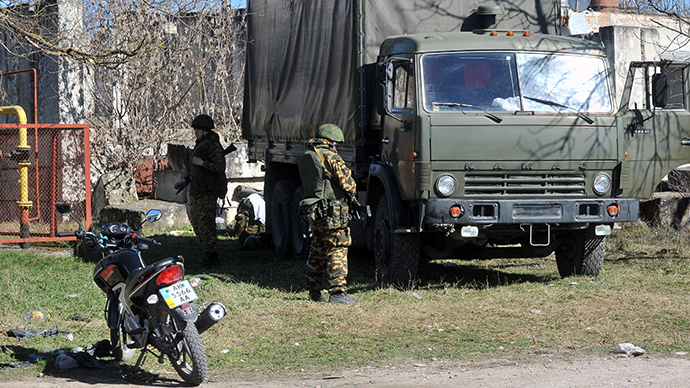 We are ready to help them,” said Igor Dorokhov, a former officer who served in Ukraine. Some of the city's deputies also called upon the local people to support the rally, which was deemed a "popular gathering for brotherly people." 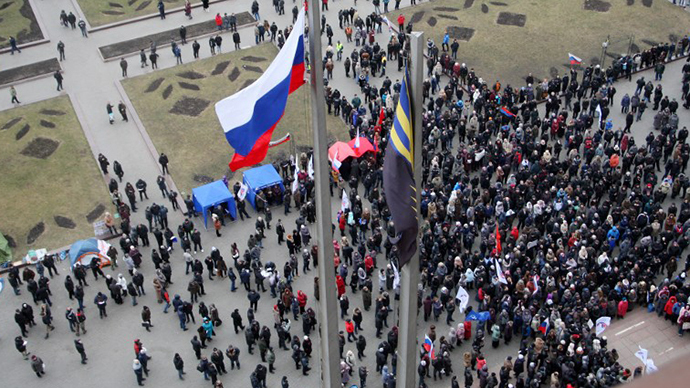 Rallies and other actions in support of the Russian-speaking population of Ukraine also attracted nearly 5,000 people in the southern city of Belgorod, the capital of the region which borders Ukraine. The future of Ukraine should be determined by its citizens, not separate radicals, said the participants of the rally. “Now it is very important to let Ukrainian nation make its own decisions,” said Viktor Ovchinnikov, deputy head of Public Chamber of the Belgorod Region, adding that the Ukrainian people should feel the support of Russians. 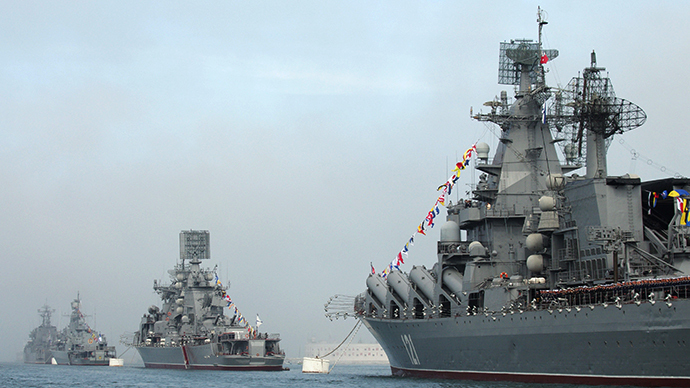 Only 80 kilometers separate Belgorod from its neighbor, the eastern Ukrainian city of Kharkov. During World War II, their citizens fought against Nazi invasion together under the flags of the USSR. A demonstration in St. Petersburg attracted some 15,000 people. The rally was organized as a gesture of approval of the decision of the Russian government, which allowed the use of Russian troops to protect Russian citizens and ethnic Russians living in Ukraine from possible violence. 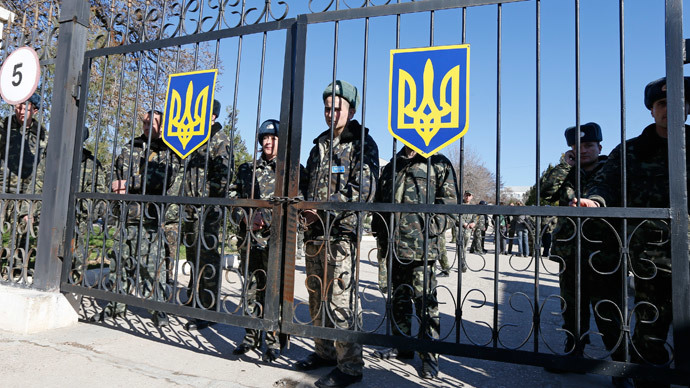 Authorities in Crimea requested Moscow’s assistance after the new self-proclaimed government in Kiev introduced a law abolishing the use of languages other than Ukrainian in official circumstances.